Last Friday was the first day of a very special exhibit at the Hayden Library at MIT. Games by the Book, curated by myself and Nick Montfort, is a small exhibit of literary works adapted to the medium of the videogame. The games in show display a variety of approaches to adaptation applied to videogames. Luckily for us, they’re all available online, so you can get to play them too. The Great Gatsby is loosely based on the novel, and is presented as a lost Japanese NES cartridge, although it’s really a Flash game made in the US. 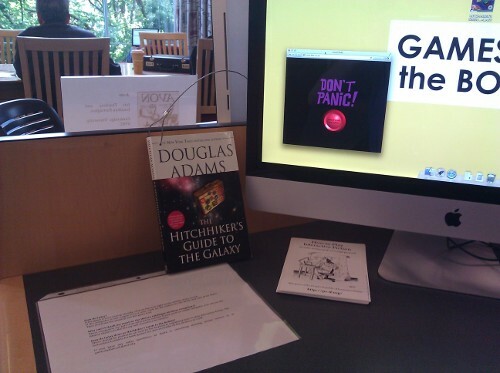 The Hitchiker’s Guide to the Galaxy is a new take on events on Douglas Adams’ novel. It’s also the only one where the author was part of the development of the game. Yet One Word is an adaptation of a specific interpretation of Oedipus at Colonus. You would have never thought tragedy was so cute. Avon takes characters and situations from Shakespeare’s plays and turns them into contrived and strange puzzles. You can read the more detailed description of the story on the exhibit’s website. Nick has also posted some photos of the exhibit on his own blog. The exhibit will be ready at the Hayden Library until October 8th and it’s open to the public. So if you’re anywhere near MIT campus, be sure to come by and check it out. Preparing the exhibit has been an enjoyable undertaking, and more laborious than one would think. The initial process of curation required taking into account what would be both an interesting selection and a good fit for playing in a public space like a library. I started by browsing Mobygames, which already features a group called Inspiration: Literature; I also browsed the pages of one of the new incarnations of Home of the Underdogs, which is one of my t0-go resources to find interesting and off-beat games. Part of my goal was finding games that one would not think could be adapted to a videogame. So the likes of H.P. Lovecraft and Tom Clancy were out, and in was my old friend Will Shakespeare. The trickiest part was finding games that would do well in an exhibit. I had to be easy to set up and maintain, since the library staff couldn’t do tech support, and neither of us could be checking on it constantly. Complex setups and special peripherals were out of the question, because the library is a public space with no security. Most importantly, it had to “play well” in a public space. Patrons would not spend hours playing these games, but only a few minutes, even if we weren’t counting on heavy traffic. That left out a lot of adventure games. The Hitchhiker’s Guide to the Galaxy and Avon, both works of interactive fiction, where chosen because they feature tricky puzzles and game over states, which results shorter play sessions by design. Interactive Fiction is also a good fit for the library, because it has no sound, so we don’t have to worry about headphones being unplugged. The other two games, Yet One Word and The Great Gatsby, are flash games with short play sessions as well, and although they both have music, neither is loud or obnoxious. In the end, computer games were favoured over consoles, because a console would have needed a cage or custom cabinets, so people could not take the game cartridges or disks; game controllers may be tempting to abscond with, while keyboards and mice are cheaper to replace. A last consideration was keeping the computers offline, or limiting the websites that could be accessed. Patrons to the library tend to use the computers to check their email or social websites, instead of looking up books in the catalogue. During the process of setting up the actual exhibit, I found myself using a lot of my game designer brain, because an exhibit is also an experience. Having worked on adventure games for quite a while now, the process of designing the actual set up of the exhibit requires asking oneself similar questions. Where does the visitor start? What do they see? How do they know what to do? How can this break, and how do we prevent it? The answers to some of these questions resulted in specific design features, such as using the screensaver as a prompt to attract people to the computer, or including game manuals and brief instructions. The postcards on how to play interactive fiction are part of the display, since the genre is not as intuitive as us IF lovers would like. Other things, like using parental controls to limit access to certain websites, creating direct access to the games on the desktop. The exhibit also required some handiwork. Any recognition to the idea to tie the books with a cable to the computers has to go to Nick, who also drilled the holes through the books himself. You can see how that looks like. It’s been a cheap way to keep the books in place, and so far it’s worked. I haven’t lurked around the exhibit long enough to see how people approach the exhibit. So far, most people walk around it, look at the books, but don’t sit down to play. Maybe a stand would have been a bit more inviting, since some people may feel self-conscious about playing videogames in public, and sitting down implies a commitment. (We didn’t have money for stands, we were lucky to get one of the Library’s computer carrells.) Looking at the activity logs, people have been playing the games, from 8 to 12 people per day, most for one minute, and 4 or 5 from 15 to 20 minutes. So we do have visitors. After a decent stakeout at the library, I should be able to report more details soon. The process of creating this exhibit has been quite enjoyable and gratifying. The overlap between curation and exhibit design and the process of making a game has enough points in common to allow me to use my background designing games. So I hope this is the first exhibit of many!